This was a last minute meal idea that turned out wonderfully! Not only did it taste fantastic, it was quick, easy, and required minimal clean up, so it would be great for a week night dinner. 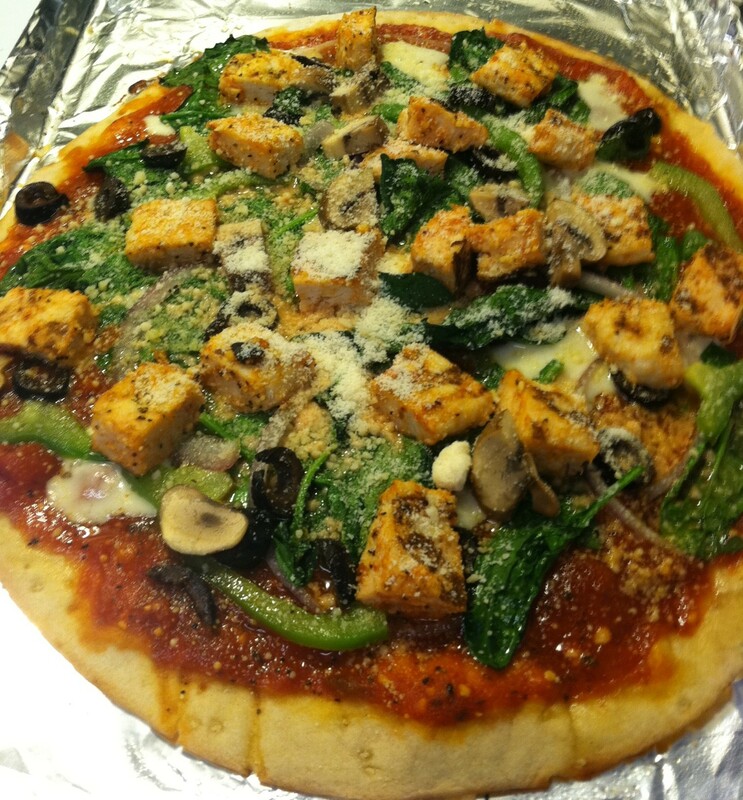 I was craving a fresh and healthy pizza, but I didn’t have what I needed on hand in the way of veggies or meat. I didn’t really want to make a grocery store run and then have to spend time chopping and preparing everything (#lazy). Besides that, when I’ve made pizza at home in the past, I’ve always had more topping ingredients left than what was needed for the meal. I hate to spend money on food for one meal, only to end up with a lot of random leftover ingredients(#cheap). I actually had everything I needed on hand for the pizza base–wraps in the freezer for a crust, a jar of marinara sauce, seasonings, parmesan cheese. I really only needed the toppings. Then it dawned on me. Subway is right around the corner. I could use one of their salads as the ingredients for the toppings. It was the perfect amount for two pizzas. No leftovers to waste. I spent a grand total of $7.49 cents for the salad. With what I had on hand, the meal couldn’t have totaled more than $5/serving. 2. Line two baking pans with foil and place the wraps on top. 3. Combine the Marinara and half the seasonings as well as half the cheese. Spread over the wraps. 4. Sprinkle the meat (if using plain chicken breast) with the remaining seasoning. 5. 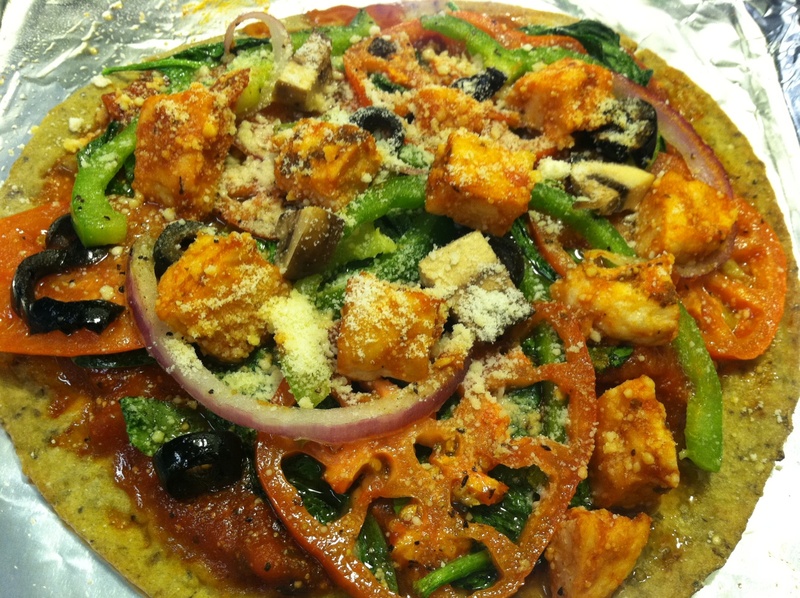 Divide the salad, and layer the spinach over the marinara, then add the remaining veggies and chicken over the top. 6. Spray the entire pizza, including the edges of the wrap with olive oil spray- this will make the edges nice and crisp! 7. Place the trays in the oven on the middle rack and bake until edges are crisp and veggies are cooked, about 10 minutes. I would check it about 7-8 minutes and if getting close, sprinkle with remaining Parmesan before returning to the oven to finish baking. 8. Once done, remove from foil with a spatula and serve!